Located north of New Orleans on Hwy. 61, the main highway to Baton Rouge, it opened May 1, 1962. The track was built on land owned by the Haydel family. Racing on the first and third Sunday of the month, it was operated by Tom Lasseigne (La- Sang) and his wife Bertele, who was related to the land owners. Lasseigne operated a Gulf service station located near Elysian Fields and Gentilly Road in New Orleans, what is now a McDonald’s. The entrance and pits were near the highway, and there were houses who’s back yards backed up to the track boundary on the right side, and fans often were seen sitting in lawn chairs in their yard watching the races. One unique feature at the track was a set of roller starters used to replace the short “fire up road”. 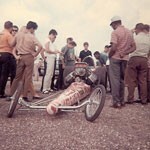 Also see at the US Nationals at Indianapolis, these rollers were powered by a V-8 Chevy engine. At the time, most tracks pitted the “hot cars” near the finish line and push started them from that direction. The layout of this track prohibited that method. In the early 70’s the track was sold to Tom Sanford, a racer from Morgan City, LA, who brought in John Durbin, a well known California personality and promoter, to manage the facility. He announced a move to Saturday night racing, but the local police jury (County commissioners) introduced a bill in the legislature to allow them to “control all aspects of racing at facilities within the jurisdiction, including gate times, purses, and all other aspects.” With the assistance of Dave McClelland, who was managing Southland Dragway in Houma, LA, at the time, the bill was killed in committee, but only after Durbin agreed not to install lights at the facility. In 1972 or 73 Sanford sold the track to “Moose” Pearah, who operated it until its “Last Drag Race” on March 22-23, 1980. During his tenure, LaPlace hosted the first “Cajun Nationals,” which moved to State Capital Dragway the next year.